Greetings, once again! Welcome to the second installment of my 2018 Dread Elf adventures. 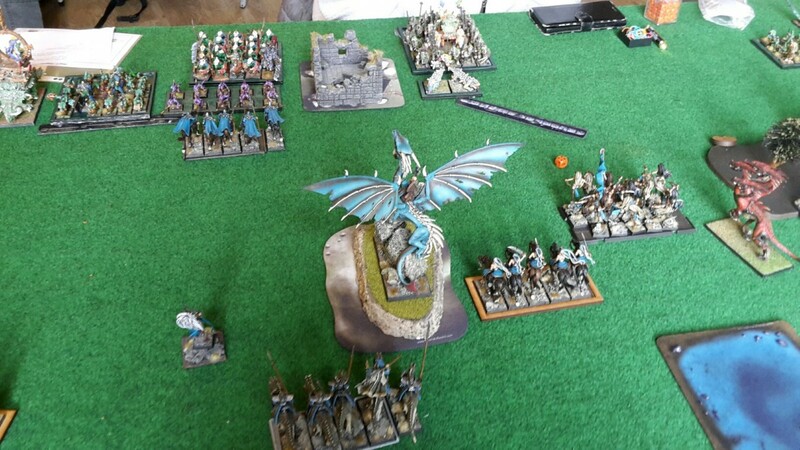 On the last weekend of October I participated in what was to be the best T9A singles tournament in Belgium, and probably one of the best in the world: The 2nd Tower Conquest! Organized by friends and T9A team mates that are members of the Ebony Tower club in Ath, this tournament attracted no less than 42 players, a record for our small country, with another 10 or so being in a waiting list and finally declined because of space/infrastructure issues. So picture this: the event takes place inside an actual Medieval tower, in the heart of the small city of Ath in southern Belgium . The organizers had thought of everything: lists and rounds posted online before the tournament, a nice and comfortable tournament schedule, great food for Lunch, drinks on demand at your table and, finally, lots and lots of prizes! I cannot congratulate them enough, and will start this report by saying that I strongly recommend this tournament to any player that would be within driving distance of the city of Ath. Continuing my foray into everything Dread Elf, I took the same list as I’d taken in the Challenge tournament last month: with no time to test anything else, I went with what I knew! For thoughts on the list, you can visit the List-building thread in the Dread Elf subforum. For the first game of the day, I was to fight Cedric, who came all the way from France with a couple of his mates! 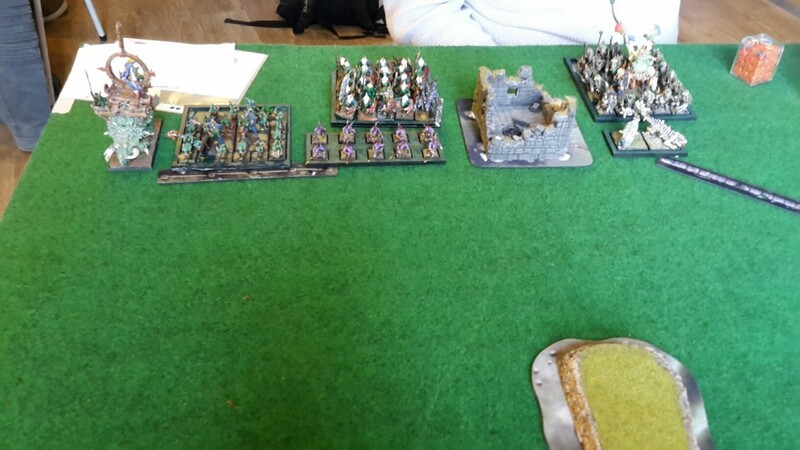 He brought a very old-school looking Saurian Ancients army which reminded me of the first real army I ever owned, the 5thedition WHFB Lizardmen! Taurosaur w/ Engine of the Ancients. 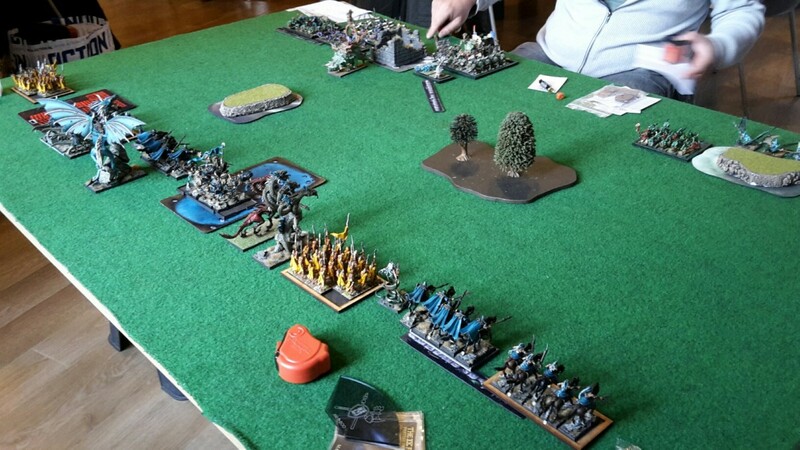 So an all-around force with very good ranged output due to magic, two mobile threats in the Taurosaur and the Warlord on foot, and a couple of durable blocks. We would play Frontline Clash and Breakthrough. My opponent picked Pyromancy for his Cuatl, and got Fireball, Pyroclastic Flow, Burning Embers and Cascading fire, while the Skink got Healing Waters and the Summer Growth. In return, I picked Ice and Fire, Crippling Fatigue, Pentagram of Pain and Breath of Corruption for the acolytes. Going into the game, I knew I had to rush forward in order to limit the amount of shooting and magic that the krakens would have to weather, but I’d have to do so while covering my advance and denying any easy charges to the Taurosaur. 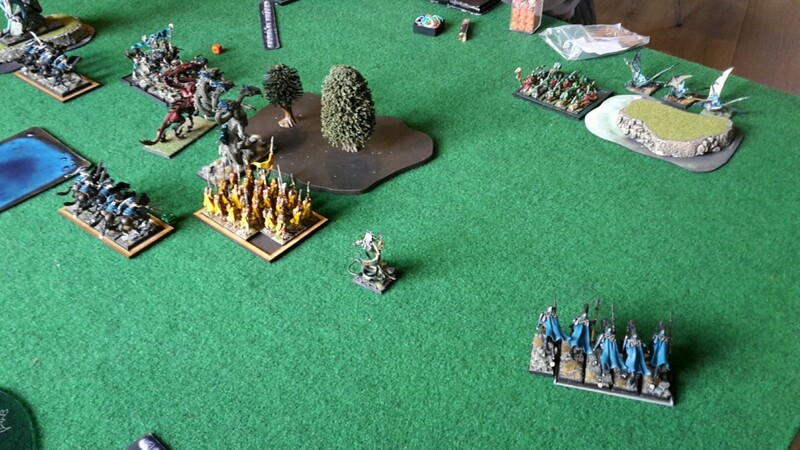 After deploying my fast troops in a balanced manner, I dropped the rest for the first turn, placing both krakens and the dancers centrally, with medusa/dark raider/legionnaire detachments on either flank and the dragon ready to move on either side of the hill for second turn charges. 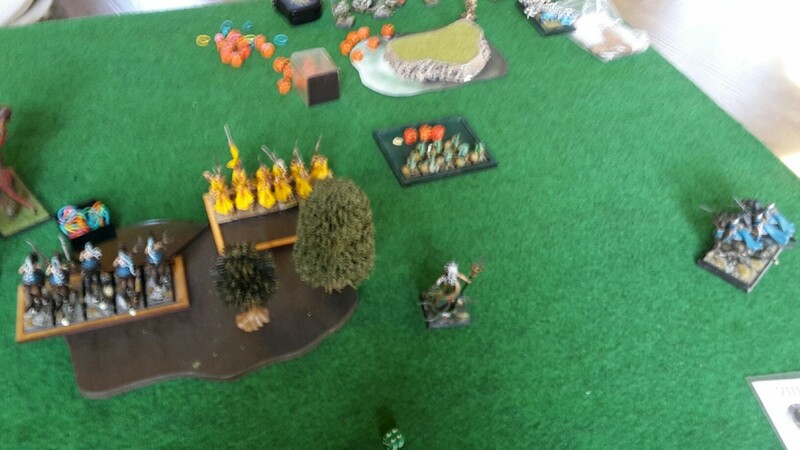 My opponent went for a denied flank approach, using the Temple Guard to protect the center and weighing heavily his right flank. 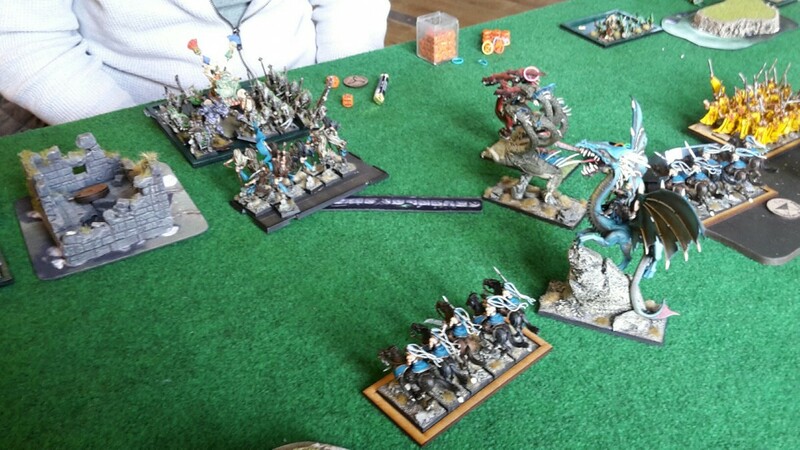 While this approach was valid, it gave me an opening: the Skink Hunters were in a position where they’d block the Serpent Warriors if I placed my dark raiders in front of them, meaning that I’d be able to push aggressively with no fear of retaliation for a turn or two, from either the Warriors or the Warlord. 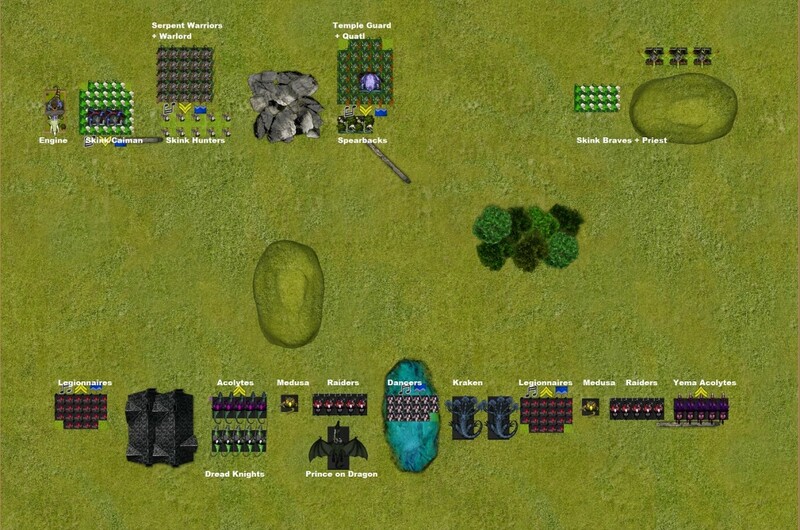 With the above in mind, I pushed the dark raiders forward, aligning the rest of the left flank contingent for counter-charges if my opponent decided to charge the dark raiders instead of shooting them The dragon parked on the hill with clear view of the entire Saurian battleline, eager to use the reroll for charges on the following turn. 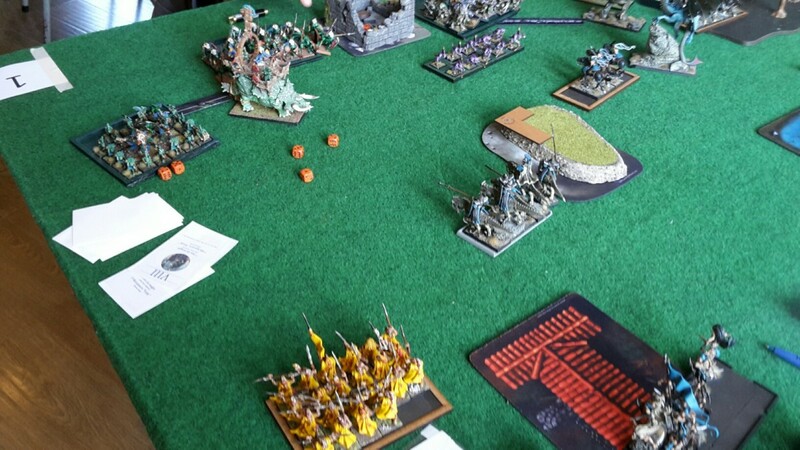 Both krakens moved as far forward as possible, while the Dancers also made a full march move, in a calculated risk: they’d have to take the Spearbacks’ shooting to the face with no penalties, but their huge charge range meant that I’d be rid of the Spearbacks on turn 2 no matter what. Finally, to the right the Pteradon Sentries were doing a fine job of keeping my fast units from getting to the skink brave bunker, so I relocated the yema acolytes towards the middle, staying out of range from the sweeping attack. In magic a Pentagram of Pain went off on the Spearbacks, dealing two wounds. 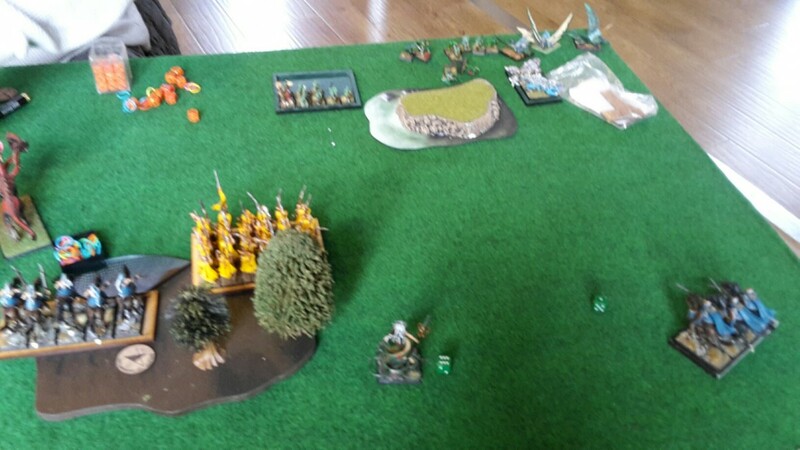 With half the battleline blocked by the Dark Raiders, my adversary shuffled a bit the Taurosaur and Skink/caiman unit, while the Saurian Warlord moved into the temple guard unit instead, abandoning the stranded Serpent Warriors. The spearbacks moved up towards the dancers of yema. In the magic phase the Pyroclastic flow wasn’t cast, meaning that I only had to let a Fireball through on the Dancers of Yema: one elf died to the flames, but this left me with enough dice to dispel the Burning Embers on the same unit. A kraken took a wound from the Saurian Hereditary Spell, too. Shooting was also underwhelming, the spearbacks’ shots only dropping three Dancers. The Hunters fared better, killing all five dark raiders in front of them. The Dancers charged the spearbacks right in front of them, with an overrun path into the Temple Guards. 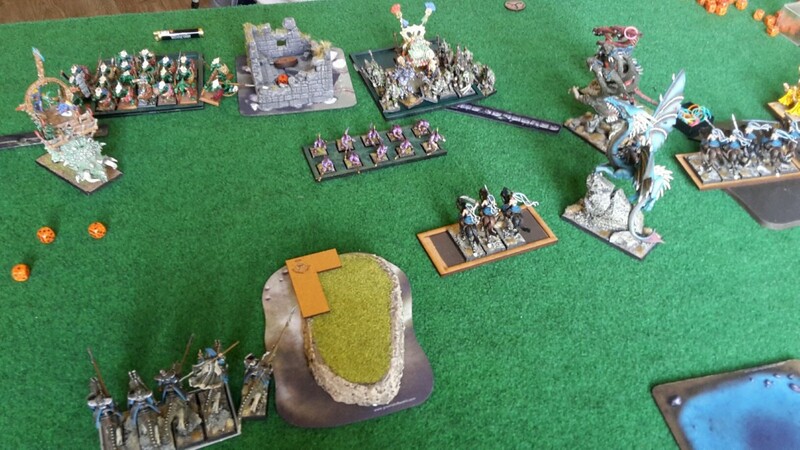 The leftmost medusa moved up in front of the Hunters, trying to repeat last turn’s chaffing exercise, which meant that the Dragon and Kraken could all focus their attention on the Quatl/Temple Guard unit. In the magic phase I managed to cast the Breath of Corruption on the right Acolytes, and the Pentagram of Pain on the Pteradon Sentries. A couple of casualties later, the Pteradons panicked off the board, making things considerably easier on the right flank. In shooting, I got a great roll for the Breath Weapon, resulting in 9 dead Skinks. They didn’t panic, though! In combat the Dancers managed to kill the Spearbacks outright, but fell a couple of inches short of the Temple Guard unit. The Temple Guard fell upon the Dancers of Yema, while the Taurosaur spied a corner of the left medusa and flanked it. I was ok with that, as it kept the Serpent Warriors in place for yet another round. 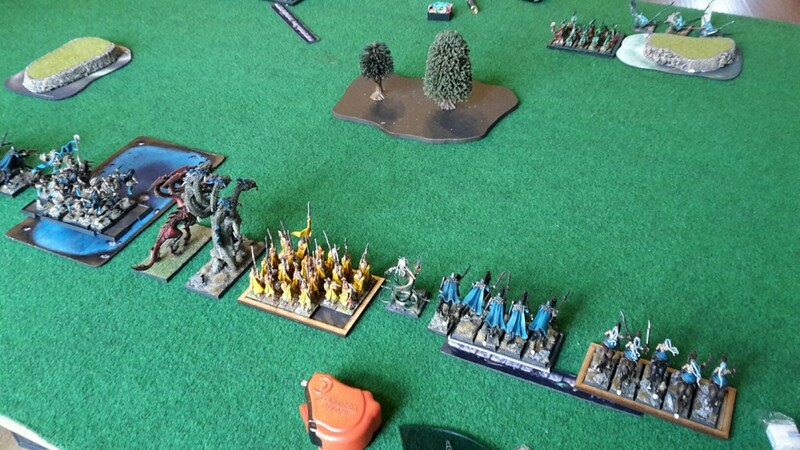 The Braves moved sideways towards the dragon and krakens, while to the right the Skink Priest left his unit, ,allowing the braves to move aggressively towards the medusa and past my Dread Spears. With most of the Pyro spells impossible to cast, I settled for dispelling the Burning Embers, leaving the Throne and the Healing Waters through on the skink braves. Shooting felled a couple of Dark Acolytes from the left unit, but they passed their panic test. 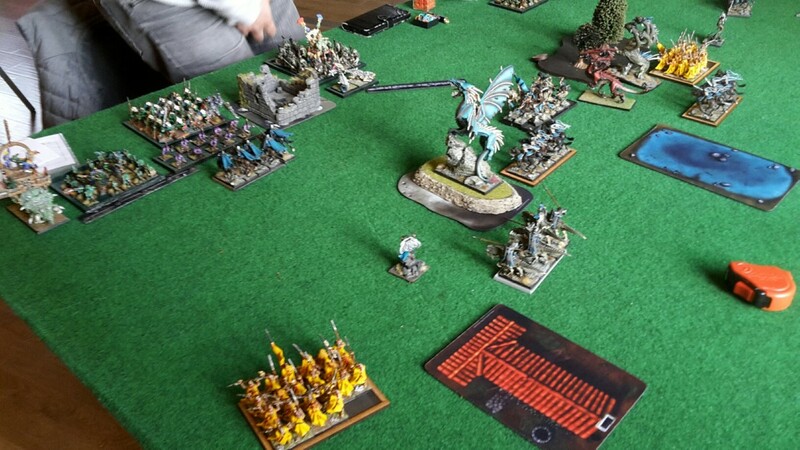 In combat the Temple Guard beat the Dancers easily and ran them down in pursuit, at the cost of the Temple Guards’ unit champion, while the Taurosaur also trampled the Medusa and reformed to face towards the Dread Elf lines. 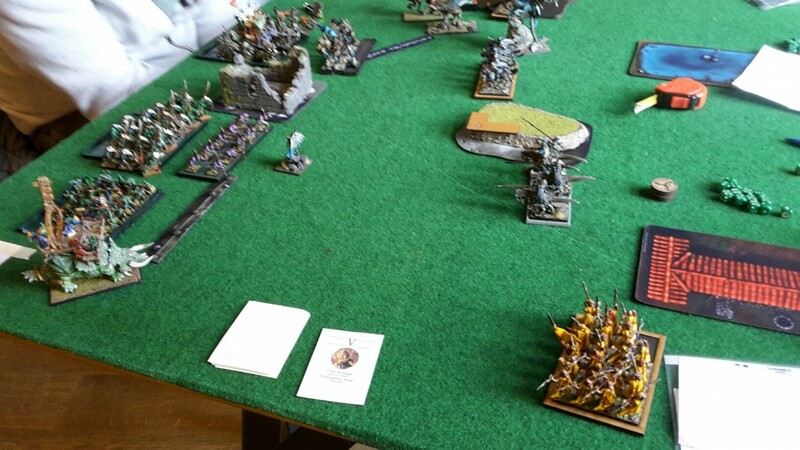 This was the decisive turn: almost the entire DE army charged forward! The Dread Knights charged the Taurosaur, hoping to pin it in place for a turn, Both Krakens went into the Temple Guard, front and flank, with the Dark Acolytes conveniently managing to squeeze past the blocking Braves now that they had suffered acouple of casualties! The Dragon charged into the Skink Hunters, with a clear overrun path into the Temple Guard too.To the right,the medusa charged into the now depleted Braves, while the remaining Dark Raiders managed a very long charge into the skink priest. All of the charges connected, much to the dismay of my opponent! In the magic phase I got a great phase, allowing me to push through the Crippling Fatigue on the Temple Guard! 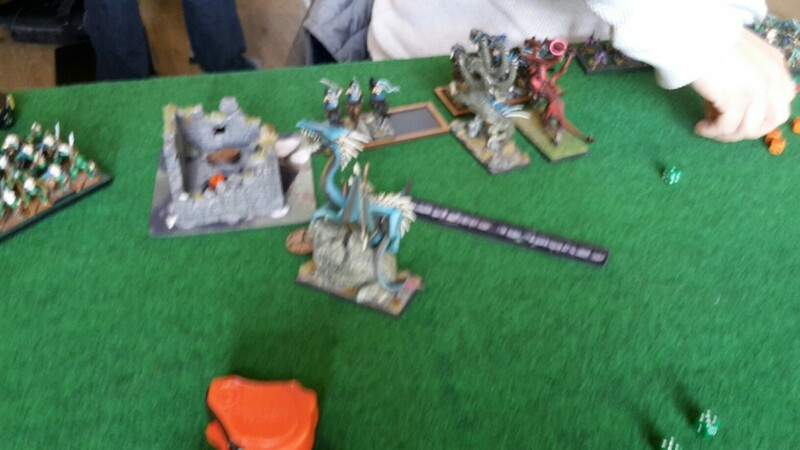 The combat started with the dragon breaking and catching the skink hunters in pursuit, slamming into the Temple Guard. That combat went in my favor, quite predictably: the Acolyte champion challenged out the Saurian Warlord, leaving the dragon and two krakens to go to town on the infantry: aided by the rerolls to wound, the three monsters and the acolytes managed to kill the entire unit before it even got to strike! That proved to be too much for the Quatl and the Warlord, who fled automatically and got cut down! The success continued with the Taurosaur/Dread Knight fight, where the Dread Knights managed to deal three wounds on the beast, armour saved the wounds it dealt in return and broke it, causing the nearby Skink/Caiman unit to panic off the board! Unfortunately, the Taurosaur was able to get away and rally on the following turn. On the right flank the Skink Priest died to the Dark Raiders’ attacks, while the Braves held in combat against the Medusa but not for long. With the entire SA battleline crumbling, there was very little my adversary could do.The remaining turns of the game were essentially a cat and mouse play: the Saurian warriors killed the Dread Knights, but in return they got flank charged by a kraken, broke and ran. All that was left by turn 5 was the Taurosaur on two wounds, so we called the game there. 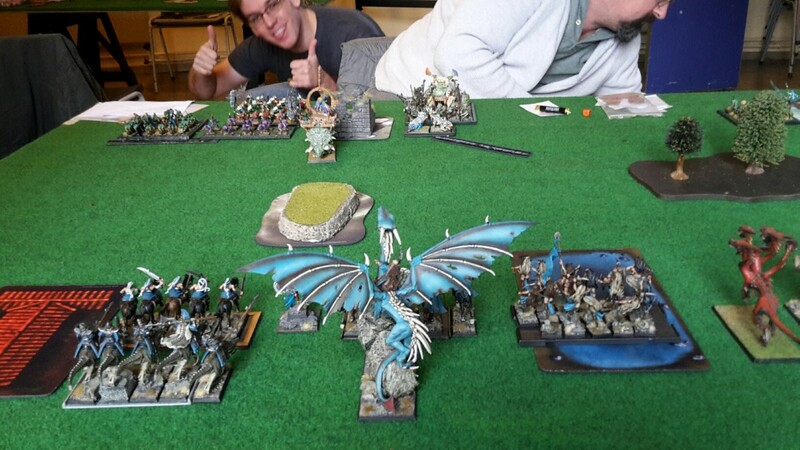 20 – 0 Victory for the Dread Elves! That was a very successful first game for the Dread Elves, which could be attributed to a number of factors: my opponent’s choice of magic path, the deployment and the fact that I got to play first. The fact that I didn’t fail any charges and my dice in combat were very good certainly helped, but once the left flank was pinned down and the mid-sized temple guard unit was facing two krakens and the dragon at once, it was a done deal. After the game we discussed with Cedric about how he could have approached the game, and I think that the two key elements would have been to keep the Taurosaur closer to his lines and to not block his own troops with the skirmishers. The choice of path is up for debate, I would have hated to face Divination in such a matchup, since dispelling the Unerring Strike leaves the Cuatl free to attempt all kinds of combat buffs. My adversary went on to win his following two games, getting a very decent placement in the end! As for me, I was to move to the top tables, where I'd be facing a very surprising list! You didn't lose a single Dancer to the Dangerous Terrain Test in the water? Ah, I see it - under the Yema cult rules. Always enjoy your reports. Thanks for posting! I am awaiting the 2nd game! Gonna read that over and over !